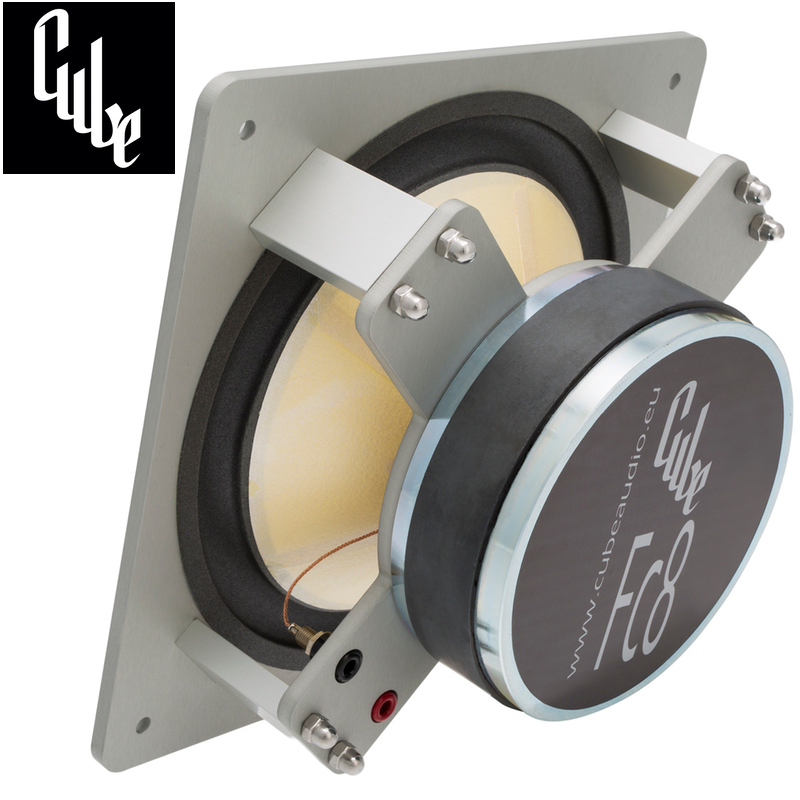 Cube Audio Fc8 is the 8" full range driver that provides second to none listening experience. Due to numerous In-house developed technologies, it is one of the most advanced full range speakers that ever existed. Customisation of every component has resulted in rich, dynamic, open, natural sound that redefines term "full range driver". Fc8 is a completely new quality in full range speakers. The level of openness, microdetail, resolution and overall holography is never to be found in full range drivers before. One of the most sophisticated magnetic motors allows this 8-inch speaker to outclass many well-established tweeters. 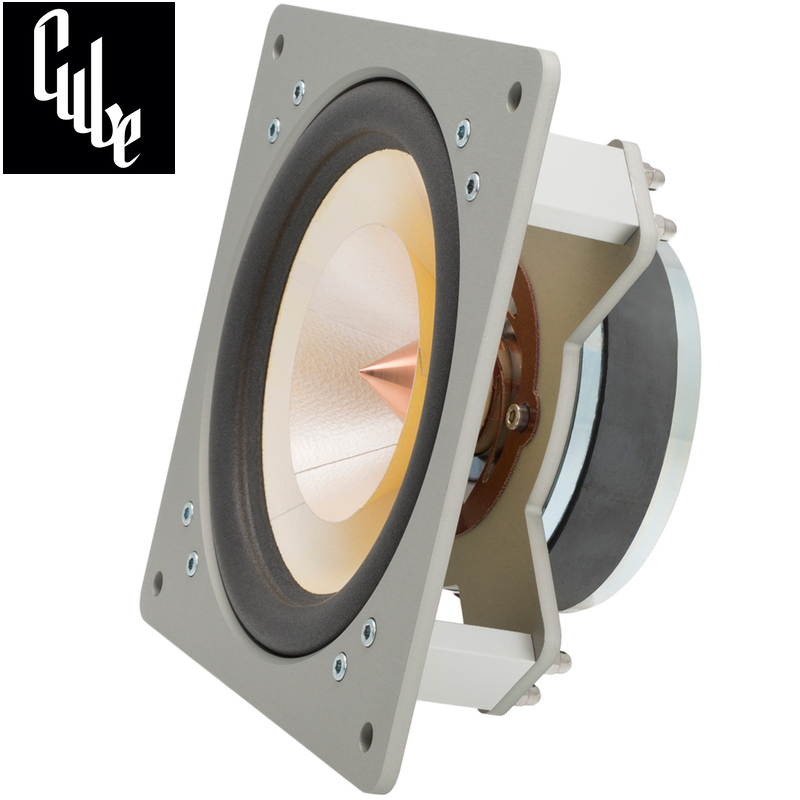 These drivers are featured in Cube Audio`s Bliss C finished loudspeaker - also available from Hi-Fi Collective and partnered dealers - to read more click HERE. We believe that full range speakers can create an illusion of live music that multiway loudspeakers struggle to match. Amazing soundstage, absolute holography, magical midrange, open and direct sound that gives you the most emotional presentation possible of your favourite music. If you have ever heard a good implementation of a full range speaker, you know exactly what we are talking about. Most full range drivers are not “full range” though. They are just “wide range” at best. Designing a real full range speaker is the biggest challenge possible for any speaker engineer. The fight is not easy because it is a fight against the rules of physics. In general small drivers tend to have insufficient bass and bigger ones struggle with high frequencies. To have great low frequencies extension the speaker needs adequate mass, cone surface and excursion. The bigger the mass the harder it is to have very good high-frequency response and with greater excursion comes greater distortions. Designing the ultimate full range speaker is an unfair fight from the beginning. When we started designing the Fa8 and Fc8 drivers our goal was to create the best full range speaker there is. The speaker that has deep but tight and well-controlled bass, without the need for huge cabinets that will take all the space in your room. We wanted an amazing midrange, without characteristic for such type of constructions, nasal sounding vocals and high frequencies that will beat most high-end tweeters. It was a courageous goal, but we were determined by our passion. The journey took us over two years of research and development. Over 200 prototypes were made. We tested multiple ideas and finally, came up with speakers that we believe will change the general perception of full range speakers. It wasn’t easy though and required the in-house design and implementation of many unique solutions. The first step was to design a magnetic motor - the heart of the speaker. For our 8 inch speakers, we designed a motor that is powered by both ferrite and neodymium magnets. The hybrid magnet system and unique geometry of the pole piece enabled us to create motors with magnetic field strength of 1.9 Tesla. Not only that, but the magnetic gap height is equal to 9 mm. That allowed the speakers to be a completely underhung voice coil design. 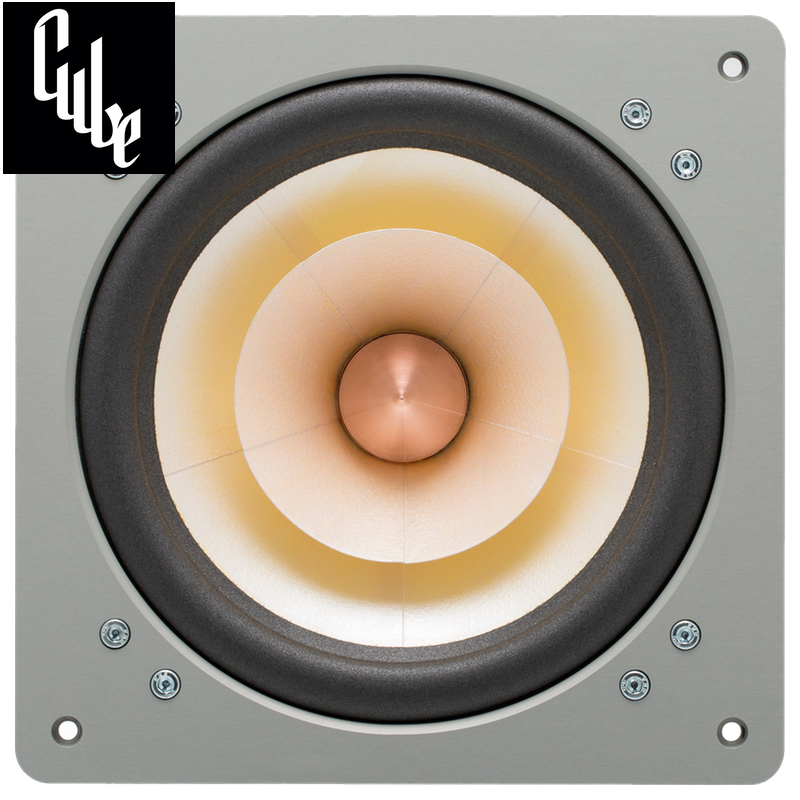 Since the voice coil practically does not leave a magnetic gap with uniform field strength along all the gap height, the raw power, linearity, and reduction of distortions are at their best. In order to maintain 0.01 mm tolerance of all elements, magnetic motor components are manufactured using computer controlled CNC lathes. Our magnetic motors were further enhanced by the most advanced Faraday Ring system that was ever used in 8-inch speakers. The elimination of eddy currents, reduction of voice coil inductance which translates to higher cut-off frequency and reduction of distortions is well worth the resultant complexity of the magnetic motor. We experimented with galvanisation of pole pieces with thin layers of various non-magnetic metals and combinations of CNC milled elements made of aluminum, brass, and copper. The combination that we decided to go with, is in our opinion is the most optimal one. Another unique solution is a lower suspension commonly called the “spider”. After listening to the prototypes with a manifold, even most advanced spiders available for speaker manufacturers, we agreed that we had to develop our own solution. The issue with the spider is that by being a damper it dissipates the energy, that otherwise would be transferred into the speaker cone. It makes the speaker sound weak and dull, so we knew that it is an unacceptable way to go. We wanted a material that does not absorb energy and only transfers it. After conducting many tests the solution was found and it turned out to be even better than we expected. It is 100 % linear within the maximum excursion of the speakers ( + - 6mm). It behaves like a spring. It does not consume the energy by damping, it just positions the voice coil in the magnetic gap. The downside of such technology is that each spider has to be milled with a precision CNC machine. Nevertheless, the advantages are obvious and totally worth it. In order to measure the actual compliance (amount of excursion under known force) of the suspensions, we designed and custom made a special device. 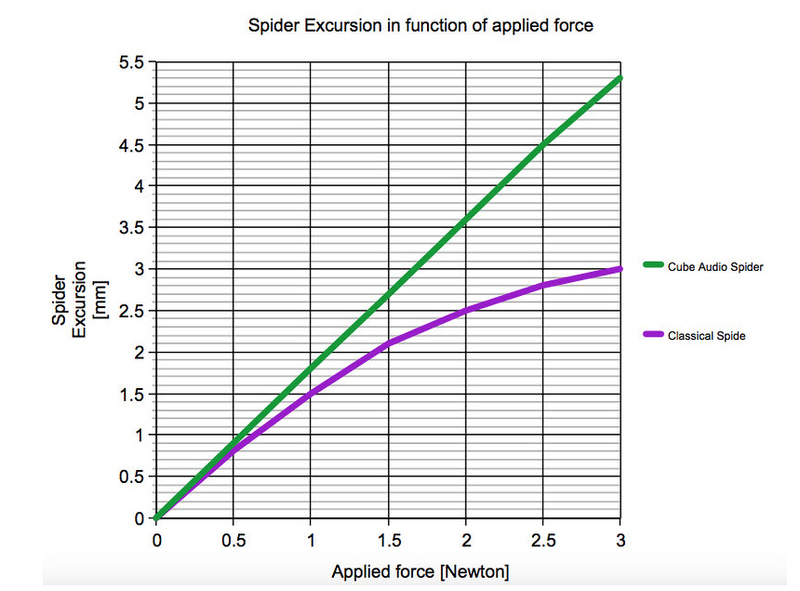 You can see the graph with a measurement comparison of our suspension and classical (resin soaked cloth) spider below. The cones used in the drivers are made of paper. We tested countless cone materials (including t-shirt cotton soaked with hardening solution that was so rigid that you could crack and crush it just like an eggshell). Whatever we tested, the cellulose (paper) ended up as the best way to go. After many attempts to find the best sounding paper we finally got it. Nevertheless, we still had to find a coating solution. Paper that isn’t protected from atmospheric moisture will, as time pass, absorb it into it`s fibres. That results in huge sound changes. The thing that suffers the most are high frequencies. Month after month they will get more blunt, blurred and in the end - not present. We developed a lightweight organic resin solution, that completely penetrates paper and seals all pores so that no moisture will ever enter the paper. Thanks to all the technologies that we developed, we possess nearly complete control over speaker behaviour, sound character, frequency response and Thiele - Small parameters. We deeply believe that the drivers that we are presenting to you will satisfy your needs and are the full range drivers that you were always looking for. So as you can see, we are obsessed with pushing boundaries and finding the frontier of what’s possible within the full range speaker concept. We are driven by our passion and we will never stop looking for the best sound possible. It is not an 8-hour job for us we do it, because we love it. If you share our passion for full range speakers, look no further. You deserve them. All of our speakers, cones and voice coils are made and manually assembled in Poland. We take pride in our products and we always aim for the highest quality. Each speaker is tested for 24 hours before shipment to ensure the highest quality. * Voice coil remains in 100% of magnetic field.